The KeDrive for Motion platform is an ideally matched combination of control, safety controller and multi-axis drives. 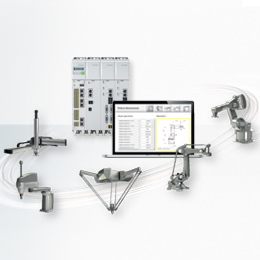 It is highly flexible and allows optimum solutions to be found for a wide range of control and drive tasks - from simple PLC tasks to highly complex multi-robot applications. It can be used to easily, safely and efficiently automate even complex systems. The system offers a wide variety of options due to the elaborate structure. 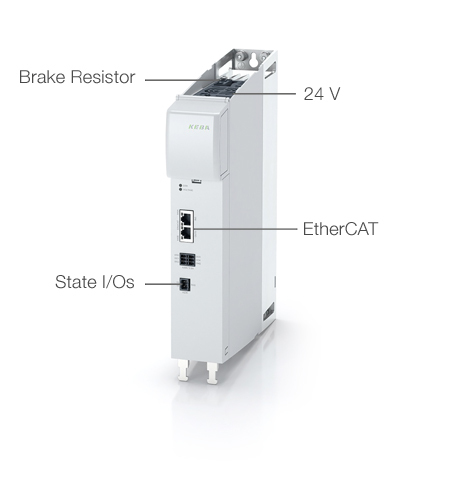 For example, additional drive modules can be directly connected or used by the control in a detached state. The highly dynamic drive modules are overload resistant to 300% and are available in 1-, 2-, and 3-axis versions. 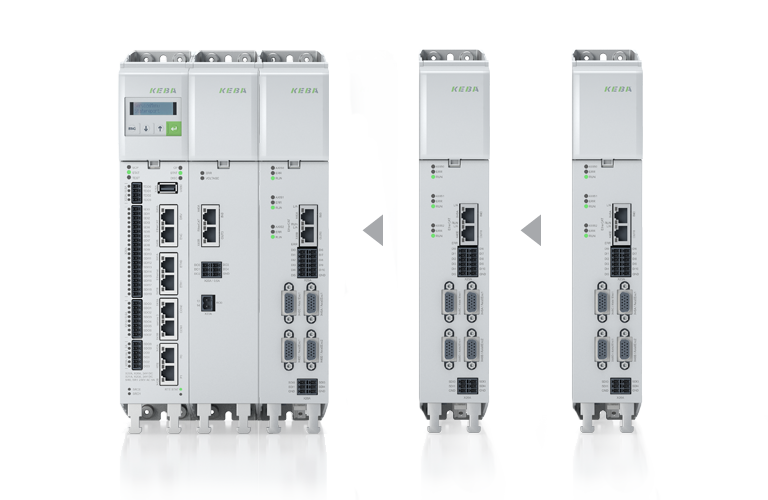 A control module with an integrated, cross-axis safety controller with safety I/Os is available as an option. Compared to standard system configurations, the compact KeDrive for Motion system takes less than half as much space in the control cabinet. 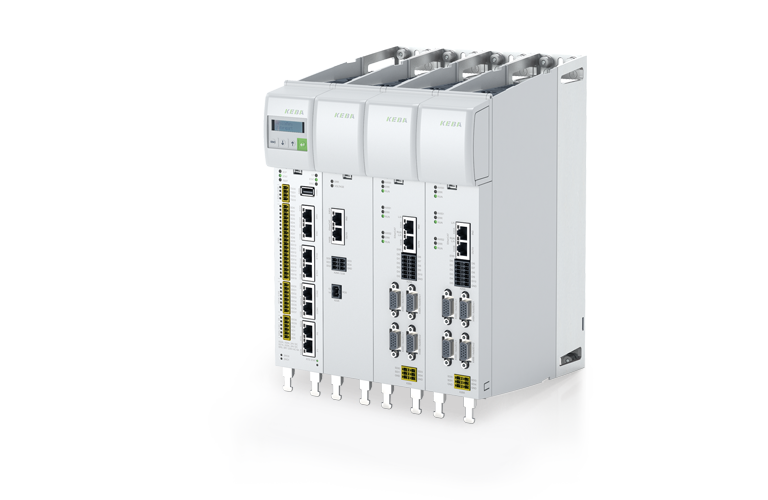 The D3-DU control solution for drives, PLC , motion and robotics is very high performance with maximum flexibility. Different CPU versions - from the Intel Atom 1.3 GHz to the Intel Core i3 2x 2.1 GHz - facilitate application-optimized computing power, thereby enabling drive control, visualization, control, image processing and standardized PLCs to run economically on a single control system. The control module is optionally available with a directly integrated safety controller including safety I/Os. A small display supports with quick configuration and diagnosis of the control, safety controller and drives. The safety controller is a safety option integrated in the KeDrive D3-DU. The integrated design means that the requirements with regard to compactness in the control cabinet are particularly well met. 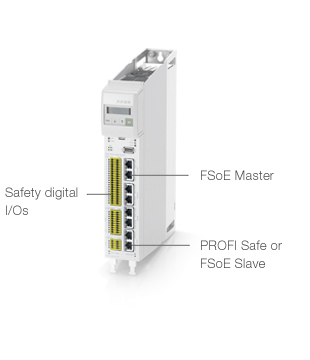 This safety controller combines safety logic and drive monitoring in one device. Additional safety functions in the drive are therefore no longer necessary, with the exception of STO. Simple safety tasks through to enhanced safety-oriented robotics solutions can be implemented easily and quickly. 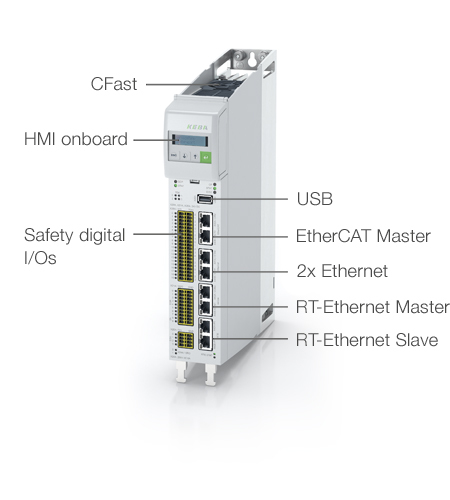 The safety controller already has 30 fail-safe inputs and outputs and enables extension via EtherCAT. 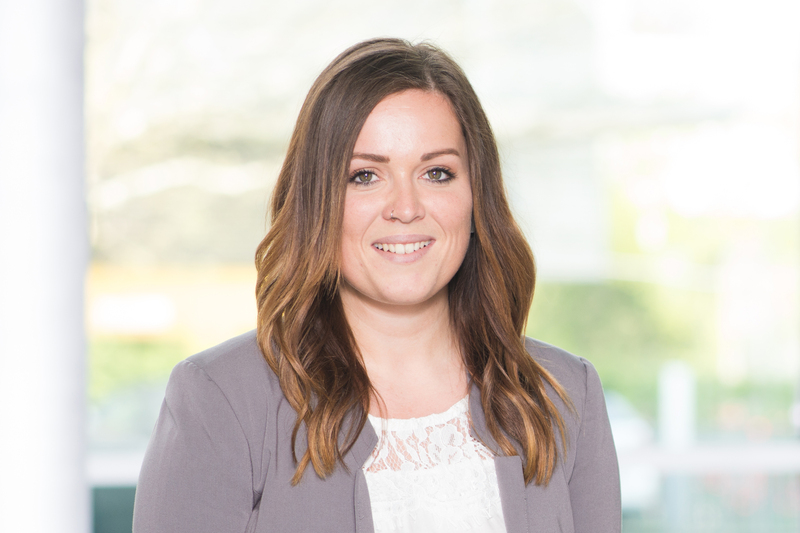 A graphical programming tool with numerous predefined functions allows simple configuration of safety sensors and actuators and even entire robots. Inputs and outputs can easily be linked to the safety logic by means of “drag & drop”. The supply unit offers a central mains supply for the entire axis system and ensures a simple as well as time- and cost-optimized installation. By supplying the axes via a DC link, an optimum energy exchange takes place between the axes. The braking energy produced during regenerative operation is dissipated via a common, central brake resistor. In addition to the power supply, 24 V of control voltage is also available for drives, control, safety controller and peripheral devices. In the event of mains failure, the required energy is taken from the DC link to safely bring the drives to a standstill. 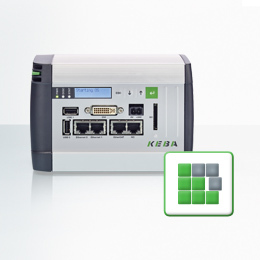 The KeDrive DA axis controller, with its various design versions, offers optimum flexibility and economic efficiency. Thanks to the feedback-control version with 1 to 3 axes in one module, a modular and very compact design can be realized. The KeDrive D3-DA axis controller operates all common synchronous and asynchronous motors and direct drives. 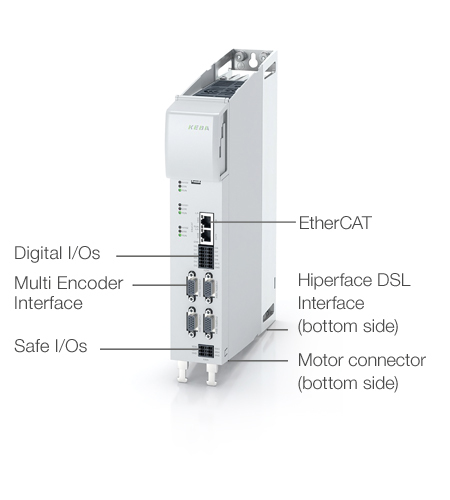 With the multi-encoder interface, a wide range of encoder types can be connected to one interface. The most fundamental, drive-integrated safety function STO (Safe Torque Off) prevents an unwanted startup of the motor according to EN 60204-1; it safely renders the drive torque-free. This function in combination with the optional SBC safety function (Safe Brake Control) is integrated as standard in the axis controllers. The inputs, which are likewise integrated as standard, can be configured for detecting end position switches or reference switches. They can also be freely occupied with any digital sensors and evaluated in the control application.